Today I’m going to have a lot of fun. Today is going to be a really awesome, oops, I mean argggh-some post. 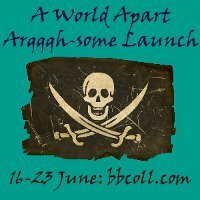 Because today my friend, David Brown is launching his argggh-some new book, A World Apart, and to celebrate, there are some great prizes on offer at the Book Bloggers Collective. But the best part is that I get to be a pirate for a day. And believe me, I need no convincing to be a pirate. Pirates are way cool. At least the kind I’d like to be. I’m sure that in real life I wouldn’t like to meet an actual pirate at all. But, in my imagination, there would be nothing better to be than a blow-me-down, shiver-me-timbers, avast-me-hearties sort of pirate, sailing over the seven seas in search of adventure. So that’s exactly what I’m going to be. Ok, so maybe I’d be a quiet kind of pirate. I’d probably sit at the back and ask politely for the bottle of rum, and then take a very measured and polite little swig before wiping the top of the bottle with my hankie (in order to prevent germs) and passing it on. Come to think of it, I would probably be the sort of pirate who would stay on dry land as I tend to get seasick. But in my imagination, I’d be off on all sorts of adventures. I’d be sailing the seven seas, searching for new ideas to turn into stories. Sure, I suspect I’d be stealing and plundering some of those ideas from others, but lets face it, which of us doesn’t do that? And at least this way, I don’t get to walk the plank. Although, come to think of it, there are times when I feel like I’m hovering over the edge of the oceans. And what are those shark-like creatures darting around just below the surface? Surely not a bunch of reviewers waiting to stick their fangs into me. Yikes, now I definitely want to stay nice and safe and dry. All right, so maybe I wouldn’t ever make the most convincing pirate.But if you want to be off on a real pirate adventure, you could do a lot worse than take the journey to A World Apart. It’s sure to be argggh-some, and I’m not just saying that because I like how it sounds. Demetrius makes his first mistake when he lets his best friend Halcyon marry Eleyna, the love of his life, without saying a word. On the day of the wedding, he walks away from the Elencheran town of Dove’s Meadow and joins the army. He makes his second mistake when the pirate Black Iris tricks him into letting dozens of men, women and children die in a fire. Demetrius is imprisoned in grief and disgrace. But he can atone. The Black Iris is dead. The Ivory Rose has risen to the top of the pirates and is leading brutal raids on the coast. If Demetrius can capture and kill her, he’ll win his pardon. And then Demetrius discovers the Ivory Rose is Eleyna. He must decide which will be his third mistake: losing his last chance at a pardon, or destroying the one woman he’s ever loved.